If you are looking for a unique way to propose - we have some creative ideas for you! Using a banner to propose is becoming a popular choice. We have created proposal banner templates that you can customize with backgrounds, clip art, photographs and text. If you are looking to make a big statement, you can have a "Will You Marry Me" billboard banner made. You can have it printed and put up on the side of the road and drive by the billboard and propose. 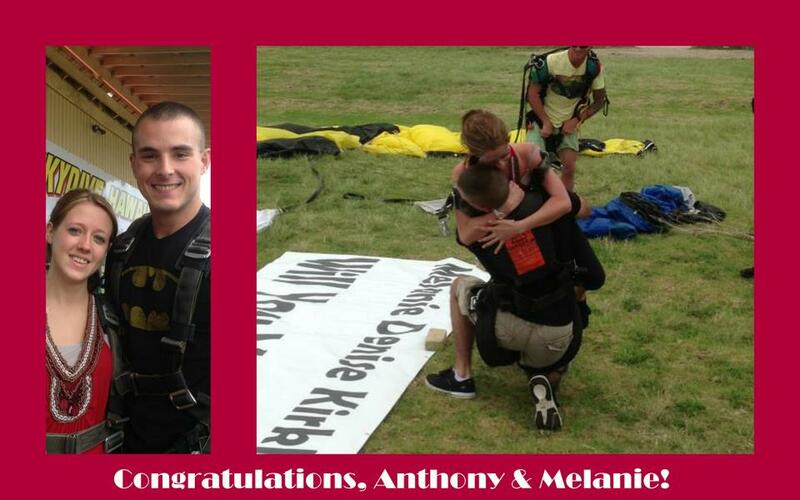 We were recently contacted to create a banner for a man who wanted to propose to his girlfriend while skydiving in Hawaii. The banner was waiting for him at the bottom of the jump and he was able to propose when she landed (and she said yes!) Check out the video of their skydiving proposal using a banner. Another common way to propose is to have a proposal banner at a restaurant. You can go out for a special dinner and have a banner hung up at the restaurant asking your significant other to marry you. Proposing on holidays is becoming more popular. If you want to make your proposal unique, you can get a holiday proposal banner made. You can hang the banner at your house, a family member's house or some other special location. There are lots of other places that you can propose using a banner. You can hold a banner at the end of a marathon or race for them to see when they are crossing the finish line. You can also have a banner hung up in an airport when you land. If your significant other is traveling, you can hold up a banner when they get off the airplane. Sporting events are another common location for proposing. You can have the banner displayed during the pregame, halftime or between innings. You can also display a banner in your house that you see when you walk in the door. There are three ways you can order a proposal banner from Banners.com. You can browse our proposal banner templates and customize by adding backgrounds, clip art, photographs and text. You can upload your own file or you can work with one of our graphic designers. Click here to get started on your "Will You Marry Me" banner. You have given good advice to implement the banners. If our banner display systems would be better then we can get more visitors.